Nearly two decades after his death the short, colorful racing career of Brazilian Ayrton Senna somehow seems bigger than ever. Especially now that we have “Senna,” an exciting (if hagiographic) documentary biography from ESPN Films. Asif Kapadia’s movie is remarkable in that it relies exclusively on vintage footage — races, press conferences, interviews, home movies — to tell the story of the handsome kid who went from go-kart racing to winning Formula One championships. The only “new” stuff here are some recent sound bites from figures in Senna’s life. “Senna” is a small masterpiece of archival editing. 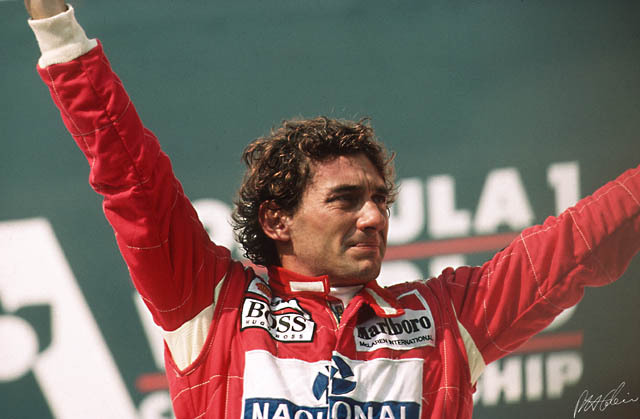 At the same time his decade-long career found Senna being raised to godlike status in his native Brazil, a country that at the time was desperately looking for something to make its citizens feel good about themselves. As the story of one man’s rise to greatness, “Senna” is solid stuff. Inspiring even. But I found it frustratingly thin when it comes to the personal details that really help us understand the man. We learn that he came from an upper middle-class family, was a God-fearing fellow who claimed to have found a sort of transcendence in high speeds. We learn that the weather most feared by drivers — rain — was the sort Senna liked most. We’re told he got involved in charities. All of which is fine, but Senna here comes off as a bit of a cardboard saint. Weren’t there any close friends willing to talk about what sort of person he was off the racing circuit? So by all means see “Senna” to experience a big dose of thrilling racing action and a tale of one man’s rise. But don’t be surprised if he remains a mystery when it’s all over.